We also offer end to end out sourcing services that enable our clients to reduce cost and time and as a result increase productivity. NGS Technologies comprise of a dedicated team of highly skilled individuals specializing in a wide variety of technologies including .NET, JAVA , c++ and open source. 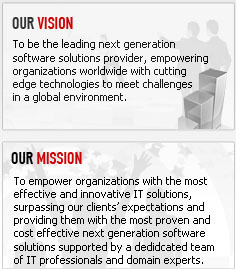 Our passion for innovative and unique IT solutions has helped us to create and offer optimum services for our clients, and meeting their business requirements.